I've been looking over the new unit floor plans and have noticed most units, and especially the largest units are all rear bedroom. Can I ask why would you want the bedroom in the rear versus the front? You usually back up your trailer to the sights. You would think you would want your living space with the large windows facing the sights out the rear and put the bedroom up front. With a rear bedroom, your living space is usually looking forward into the RV park / truck parking etc. Not sure how useful having the sights in a bedroom are. I usually just use the bedroom for two things. Sightseeing isn't one of them. What are your guys thoughts? I'd love the 31 foot classic but it is rear bedroom only. Seems like an illogical layout to me. Our 25 FC has a choice, FB or RB. We chose RB and have never regretted it for many practical reasons, one being that we sit facing the rear and don't have eyes in the back of our heads. Another is that we have never had a bad view in front, but have been in many camp facilities where a fifth wheel with a BIG window in back is parked directly behind us. Look out the rear door model and see the sewer connections of the guy next door. Step out the rear door and it may be a long way down, many campsites drop off to the back. Step out the rear door and discover the paved sitting area is up front, you're in the mud. Step out the rear door, and work your way through the picnic table and chairs you have set up, to get to the truck. So that's a few observations. But flip a coin, they both work very well and you won't regret your choice, at least until you buy the next Airstream. Then the other way will be better. Zybane - We have the front bed because the exact reasons you have stated. We both still work so we use the Airstream to take long weekends within a few hours of here. Most of the places we have visited the rear of the camper is facing some sort of woods/trees so it is nice to be able to sit down at the table and eat, play games, or whatever without the noise of kids playing, cars driving by, etc. By the time we go to bed it does not matter if the bed is next to the road because it is quiet time then for the whole campground. It depends very much on one's interests and camping preferences. There are several reasons we prefer the front bed. First of all we don't "camp" in the way I grew up using the word. To me camping is being off the beaten path in an out of the way place that you likely couldn't get a travel trailer into. Our trailer is a more convenient and comfortable way to get to or be at a destination area than a hotel or motel. We generally stay in private campgrounds. In that environment, there is seldom a view in back of the trailer. If I were in the back of the trailer, I would feel isolated from what's going on the campground. As I said at the start, it's a personal choice. I like the rear bedroom because of the arrangement of the galley and the dinette. the sofa along the side seems worthless to me. and when sitting around watching the tv in the evening I don't want to sit sideways in the dinette. Food prep is also easier when you have the dinette table next to the galley. Hm, definitely some good points made. I guess it's not as cut and dry as I thought and both have their pro's and con's. We have had two 25FBs, a 2005 Safari and a 2015 Flying Cloud. We spent almost 1,400 nights in the 2005 and towed it over 120,000 miles all over the United States. When we bought the 2005, the FB was a brand new floor plan. The only other 25 at that time was a corner bed floor plan which was totally unacceptable to us. When we were shopping for the 2015, we seriously considered the new 25RB, and spent a lot of time looking and thinking. When it was all said and done, we decided to stick with the FB floor plan. Our extensive Airstream camping experience has shown us that, more often than not, the view is better at the rear of the trailer. The front dinette's view is restricted by the tinted plastic glass protectors. We have the rear window awning on our 2015, and we really like its effect on the view from the dinette. Also, in our case, we very often stay hooked up to the tow vehicle. Our tow vehicle is a truck camper. Our view from a front dinette would consist of the giant back end of a dirty truck camper along with our scenic LP tanks. We also like the bathroom layout of the FB much better than the RB. We would sorely miss our big mirror/cabinet in the FB. The little round mirror in the RB bath just doesn't cut it for us. We had one of these little mirrors in our 23FB and didn't care for it at all. The 25RB is also a great floor plan. We just prefer the FB. Part of this is probably our extensive camping experience with a 25FB. This question tends to bring out strong opinions for either side. I think the FB vs RB question depends on where you want or intend to camp. 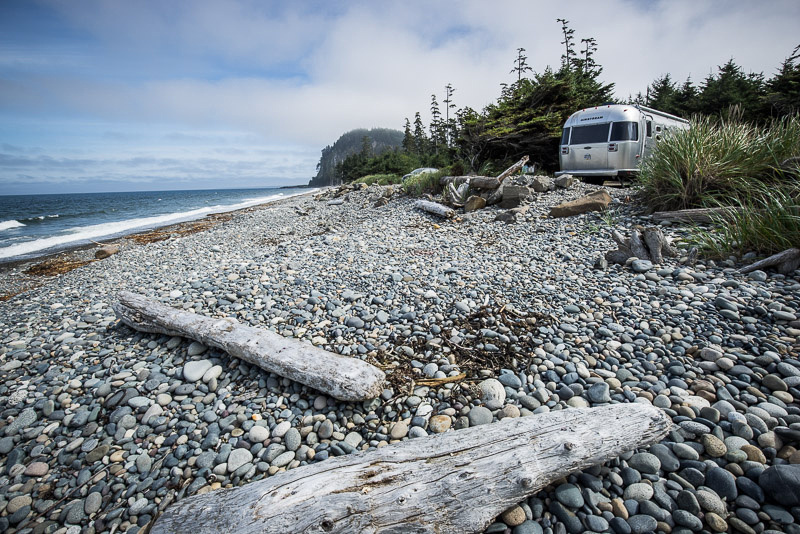 On the other hand if you seek out waterfront, lake-side, or more remote camping areas, the premium views are more often to the back of the campsite. In those cases, the FB layout allows you to have your living area where you can enjoy those views better. We delight in finding Campsites with great views to the rear and would not for a moment consider trading our FB for an RB. Brian, more good points. I keep going back and forth on FB/RB LOL. Evan is that your trailer/parking spot photo? That is exactly what I am looking for. Gorgeous. Actually our 25 Rear Bed model has two mirrors, and a window, and more floor space. With nearly 800 nights camping in this 25 RB, we think it's terrific. In reality they're all terrific, you can't go wrong. When we were looking, we strongly consider the 25 FB before choosing our 28ft RB Ocean Breeze. As the model implies, we spend a lot of time near water--we're windsurfers. A careful think through about the parks that we knew we were going to be in left us views out both the front and the back, but many view out the right hand side, instead of out the service side, which is what you get with the FB's. My clever wife figured out that with our full wardrobes in our rear bedroom, you can take the pillows and lean them sideways against the wardrobes, turning the bed into a super sized cozy couch for two right on top of the view when it's out the rear instead of the front. So we feel that this floor plan, since it also offers a view out the non-service side of the coach, continues to give us the most flexibility for most parks. And because we back into most spaces, it also gives more privacy and generally more quiet for the bedroom, too. As an aside, we love the internationals for their extra high windows and double skylights, which makes the main cabin interior super light and bright, especially on cloudy days. The three awnings are a treat, too, when it's hot (because that usually kills the wind so we can't sail) enough that we need them and the breeze is also at a safe level for awning deployment. The only downside to the front door is that with the door open, it eclipses two thirds of one of the windows, reducing view. There's clearly not enough straight wall to have the door open forward, which would give you the open doorway view plus the full view from both windows, or that would have been ideal. But either way you go, all of these layouts are great in one way or another! I'm 6'4" the split bath/shower doesn't work for me. Can't move around in the shower. The older trailers with the bathing toilet on one side work for me. If I were normal size probably would go for the front bedroom, which many of our unit members with newer trailers have opted for.